Stephen Michael Freeman and three relatives allegedly used stolen identities to cheat the lottery system for the golf event for years. Seven puppies were found in a plastic bag outside Napa Auto Parts store in 90 degree heat last week. 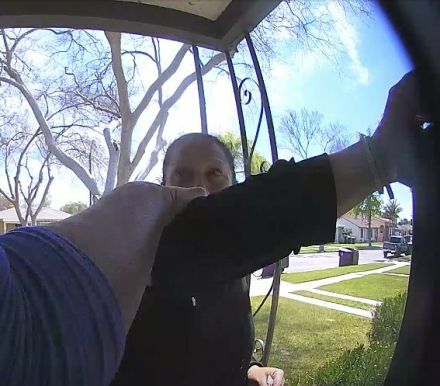 Authorities made an arrest Monday. Sri Lanka's prime minister has warned there are more explosives and militants "out there" after the Easter suicide bombings that killed 321 people. Ranil Wickremesinghe made the comment Tuesday at a news conference, and said some officials will likely lose their jobs over intelligence lapses surrounding the attack. His warning came as Islamic State claimed responsibility for the terror attack on its official Amaq news agency. The group posted an image of seven masked attackers and the unmasked ringleader, Zahran Hashim, in front of its black flag. In a statement the men were named as Abu Ubaida - thought to refer to Hashim - Abu Khalil, Abu Hamza, Abu al-Baraa, Abu Muhammad, Abu Abdulla and Abu al-Mukhtar. Isis's official news agency, Amaq, posted this image of eight attackers, including the previously identified Zahran Hashim (centre) Sri Lanka's defence minister on Tuesday declared the attacks were retaliation for a recent attack on mosques in New Zealand, adding that two domestic Islamist groups were believed to be responsible. Ruwan Wijewardene’s comments were made as the South Asian island held its first mass funeral for about 30 of the victims of Sunday’s serial suicide bombings in three high profile churches and three luxury hotels. Sri Lankan intelligence has named the mastermind behind the Easter Sunday attacks as Moulvi Zahran Hashim, an extremist local cleric who incited his followers to violence with fiery sermons on his social media channels. CCTV video shows suspected suicide bomber entering St Sebastian's Church in Negombo Isil's brief statement said they targeted “nationals of the Crusader alliance and Christians”, but made no specific reference to the New Zealand mosque attacks. At the same time, AFP agency reported that two Muslim brothers carried out two of the hotel suicide blasts. The brothers, sons of a wealthy Colombo spice trader, blew themselves up as guests queued for breakfast at the Shangri-La and Cinnamon Grand hotels in the capital Colombo. The brothers, whose names have not been revealed, were in their late twenties and operated their own "family cell", an investigation officer said. A suspected suicide bomber carries a backpack on a street in Negombo, Sri Lanka The Sri Lankan government revealed in 2016 that 32 Sri Lanka Muslims had travelled to Syria to join Isil. “All these (Muslims) are not from ordinary families. These people are from the families which are considered as well-educated and elite,” Wijeyadasa Rajapakshe, the country’s Justice Minister told parliament. said, adding that the government was aware of some foreigners coming to Sri Lanka to spread what he called Islamic extremism. A Syrian national was also arrested on Tuesday. It was not yet clear if he played a role in the attacks. Read more | Sri Lanka attacks Mr Wijewardene told the Sri Lankan parliament the massacre was carried out by the obscure local National Thawheed Jamaath group along with another group called the JMI, an apparent reference to a little-known radical Islamist group in India called the Jamaat-ul-Mujahideen. Some experts have pointed out that the sophisticated nature of the attacks suggest that they would have required preparation that began before the Christchurch atrocity. Little is known about JMI, other than reports it was established last year and is affiliated to a similarly named group in Bangladesh. "The preliminary investigations have revealed that what happened in Sri Lanka was in retaliation for the attack against Muslims in Christchurch," said Mr Wijewardene. A suspected suicide bomber carries a backpack on a street in Negombo, Sri Lanka Fifty people were killed in shooting attacks on two mosques in the New Zealand city of Christchurch on March 15, and horrific footage of the bloodbath was livestreamed on social media channels. The Sri Lankan authorities are still investigating how local militants gained the training and equipment to carry out an assault that is now considered to be one of the worst global terrorist atrocities since the 9/11 attacks on New York and Washington. One theory is that Sri Lankan extremists could have been assisted by returning fighters from Iraq and Syria. It also emerged on Tuesday that Sri Lankan police are holding a Syrian national in custody for questioning over the Easter Sunday attacks. "The terrorist investigation division of the police arrested a Syrian national following the attacks for interrogation," a source told Reuters. Two other officials with knowledge of the investigation confirmed the detention. "He was arrested after interrogation of local suspects," a second source said. Police have now detained 40 suspects in connection with the attack. Sri Lanka attacks - Locator map The first mass funeral took place at St Sebastian church in Negombo, north of Colombo, which was one of the places targeted in Sunday's blasts. A moment of silence was observed at 08:30, to mark the timing of the first bomb on Sunday morning. Flags were lowered to half-mast and people, many of them in tears, bowed their heads in respect. 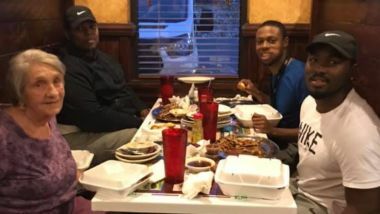 An Alabama man noticed that a woman was sitting alone at a restaurant and he invited her to eat with him and his friends. Ariana Grande and her idol Jim Carrey had a candid exchange about depression on social media, and needless to say, Grande was excited to hear from him. Coachella 2019: Justin Bieber Joins Ariana Grande for Surprise Performance! A high school student in Kentucky says that she was “extremely humiliated” by a teacher who reprimanded her for a set of overalls, which she alleges are within the school’s dress code.